← Google TV: Too Little, Too Late? You save electricity (saving money), cut down on oil, gas, and coal consumption, and reduce overall carbon emissions. That's the triple pitch behind the Earth Hour (started by the World Wildlife Fund three years ago), during which everyone is encouraged to turn out their lights for one hour. 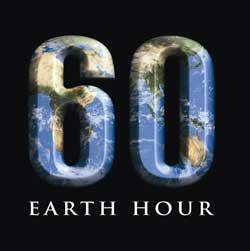 Earth Hour this year is scheduled for tomorrow, Saturday, March 27th, at 8:30 local time. I've covered this in the past and it's gimmicky, but successful. It does actually do what it proposes to do. And in this information overburdened, Tweeted-out, over-texted world we could all use an hour to contemplate something on a more metaphysical level–or just snooze. Take your pick. Scheduled to take part in the dark are more than 3,100 cities in 121 countries on seven continents. According to the WWF, that tops last year's participation by 87 countries (and look at it this way, if the economy continues to rupture, even more will participate next year!). In the U.S. more than 50 national monuments and landmarks will go dark, according to organizers, including the Las Vegas Strip, Mt. Rushmore, Niagara Falls, the Golden Gate Bridge, the Empire State Building, the Chrysler Building, and all 39 Broadway Theater Marquees in New York City. Across the world the lights will also go off at Big Ben, the Great Pyramids, the Leaning Tower of Pisa, the Sydney Opera House, and the Eiffel Tower (it's more romantic that way, anyhow). Remember, the time to throw the switch is 8:30 pm local time (wherever you are). And no cheating by using the LCD on your cell phone as a light. This entry was posted in Uncategorized and tagged earth hour, leds, lights, quain, technology. Bookmark the permalink.